This is regular ‘ol Vegan Butter that’s designed to mimic your favorite commercial variant. Use it wherever you use butter or vegan butter. 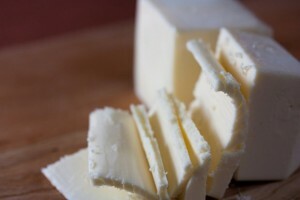 Vegan Butter is designed to mimic real butter in vegan baking applications. Like real butter, Vegan Butter is more solid than tub margarine and not as spreadable. This is so it can perform optimally in vegan baking applications. If your goal is to have a conveniently softer, spreadable Vegan Butter, swap out 1 Tablespoon of the coconut oil with 1 additional Tablespoon canola, safflower or sunflower oil. *Please note, although Food Empowerment Project is linking to this website, we do not necessarily endorse the entire content of the website or mission.